There are two office areas, a communal hallway, communal kitchen and W.C facilities. 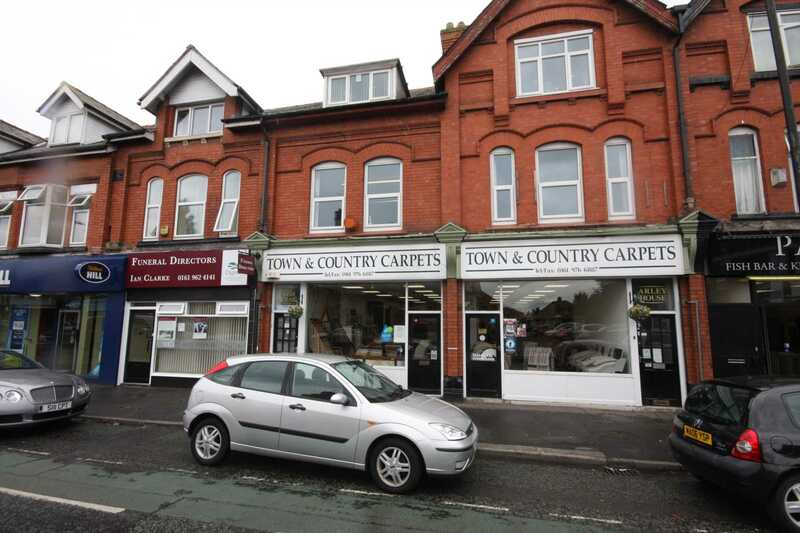 Set in the heart of Sale Moor village with easy access to transport and local services. The rent is set at £595.00 P.C.M. to include gas, water and electric. First floor office suite set out as two office spaces providing approximately 420SQ.FT of office space. Communal entrance with staircase elevating to the first floor giving access to the shared kitchen and WC facilities and a half landing leads to the main office areas. Available on flexible lease terms please ask for details. A communal glazed entrance door leading through to the inner hallway. Central heating radiator, wall mounted fire alarm panel and a staircase giving access to first floor, whereupon there is a split level landing with ceiling light and doors providing access to the office suite. With 2 uPVC double glazed windows to the front elevation with fitted blinds. Central heating radiator with thermostatic control. Fluorescent ceiling light fittings, power points and telephone sockets.. This office has dual doors from the main landing area and also a connecting door from the main office number one. Window set to the rear aspect with fitted blinds. Central heating radiator, fluorescent strip light fitting, power points and telephone sockets. Fitted with base unit with drawers and cupboard with a stainless steel sink top and taps,marble effect work surface and a range of cream fronted base and drawer units, with complimentary wall units for storage set above. Electric hob, breakfast bar area, central heating radiator and wall mounted boiler. Low level W.C and wash hand basin. Available on flexible lease terms to be agreed with agent and landlord prior to lease being prepared.